Sarah Brown, daughter of abolitionist John Brown, is destined to be a life-long spinster after illness leaves her unable to bear children. Following recovery, Sarah puts her artistic talents to good use drawing freedom maps for passengers of the Underground Railroad. As years pass, Sarah continues to devote herself to helping slaves become free men. She spends most of her time at Hill House in West Virginia, where the Hill family assists Sarah with her abolitionist ventures. Eden Anderson and her husband Jack have just moved to an old house on Apple Hill Lane. Childless and depressed, Eden is miserable at having to accept her fate of never bearing children. Shortly after her arrival to Apple Hill Lane, Eden discovers a mysterious ancient doll's head at the bottom of a cellar once used to hide runaway slaves. Eden sets out to discover the history of the doll's head, making new friends and relationships along the way that just may atone for her lack of children. Despite everything I've read over the years, I don't recall reading much about abolitionist John Brown or his daughter, Sarah. 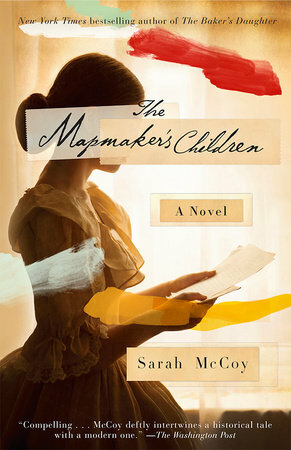 Sarah's life story is quite fascinating, and I'm slightly disappointed I saw just a glimpse of it in The Mapmaker's Children. I loved the mystery surrounding the ugly doll's head Eden finds in the cellar. McCoy doesn't reveal until later on how the doll plays into the story, but those familiar with Sarah Brown's work for the Underground Railroad will know how everything ends. I hated Eden's character for most of the novel. I enjoyed hating her, and watching her squirm when animals and small children tried to get close. But, I understand that Eden was bitter as a result of facing years of fertility problems, so I was lenient on poor Eden. Overall, it was a great novel, backed by thorough research. I appreciated how the author wove together the stories of Sarah and Eden so they complemented one another. Sarah McCoy has also written The Baker's Daughter and The Time It Snowed in Puerto Rico.